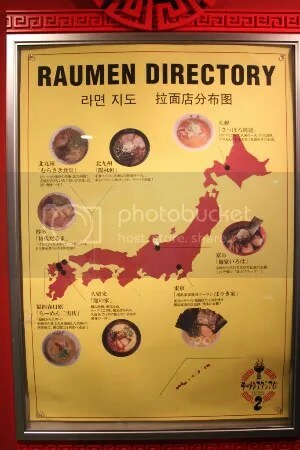 On the 5th floor of Canal City is Ramen Stadium which houses 8 outlets each selling ramen hailing from a particular part of Japan. We were a little lost and ravenous the first time we set foot in this crowded area. The long queues were a turn-off so we settled for the shop with no queue and that obviously turned out to be a mediocre lunch. Thankfully during our second visit (weekday lunch), the place was close to empty. But the shop that we wanted to go, Shodai Daruma (the one on the directory that represents 博多), still had a short queue and was full of people. That’s a good sign of course! You buy your ramen coupons from the machine outside before you queue for your seats. Once you are in, the waiter takes your coupons, shouts your order and zips off to get plastic cups and a flask of water. The parents couldn’t help commenting about how productive this system was. 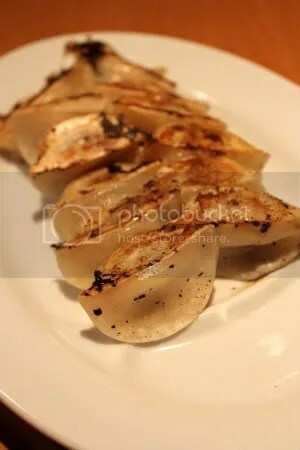 And so in a flash we got our plate of gyozas. It was a bit of an anti-climax to see these tiny little things when we were expecting the usual ones double the size. It was pan-fried to perfection with a thin skin to boot but it just missed mark because we weren’t satisfied with the amount of filling. I mean, how much meat can this little thing hold? But we were all wowed away by our ramen, seriously. I think this trumps all the ramen we have had by far. 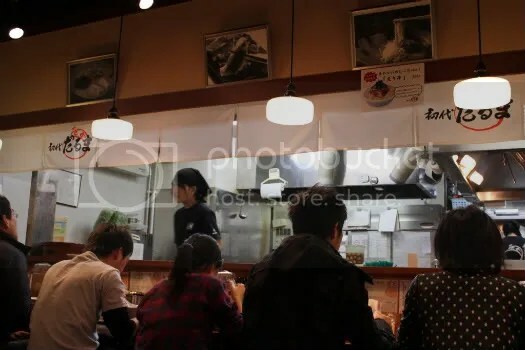 Since the ramen offered here is Hakata Ramen, Shodai Daruma used the signature thin non-curly noodles that were slightly crunchy unlike the Hokkaido ramen counterpart which is curly and springy. 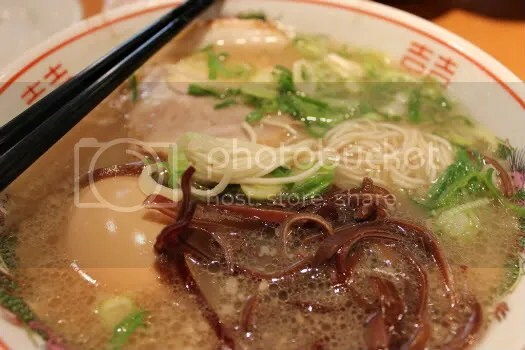 Another feature of Hakata Ramen is the tonkotsu soup base- a milky pork-bone broth; tasty and rich in flavour. I can’t imagine the hours of simmering it must have took to extract all the goodness of the pork bones! 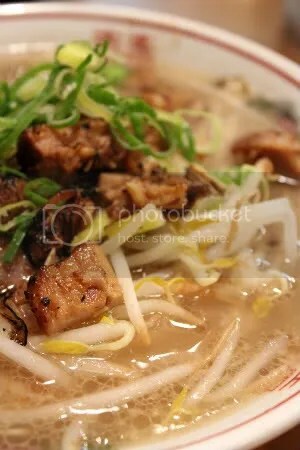 The best thing was Shodai Daruma’s tonkotsu base was not as salty as the usual miso, shoyu or shio broths. This was just right, good enough to drink on its own. All the condiments were excellent in their own ways and complemented each other really well. Kikurage (mushroom) strips were crunchy and the hanjuku was perfectly executed! The warm runny yolk made the noodles taste extra yummy. The other more expensive version replaced the usual charshu (which was very tender by the way) with these lightly charred pieces of pork. 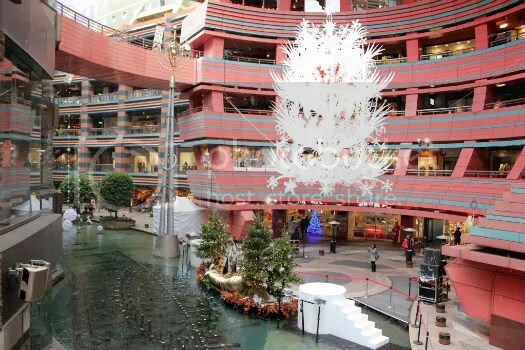 I don’t think any visit to Fukuoka would be complete without stopping by Canal City. 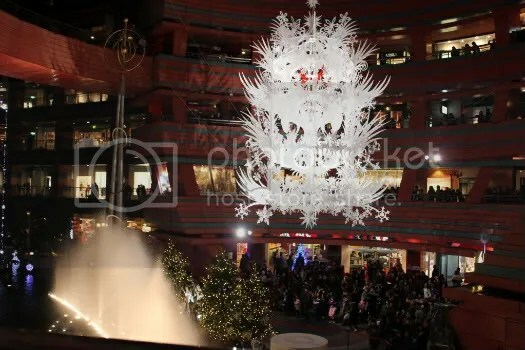 It’s probably one of the biggest (though priciest) shopping centres around the area that houses both international and local brands. If you are into golf, hiking, running etc there is a huge store selling equipment for all these sports, many of which are their own Japanese brands. 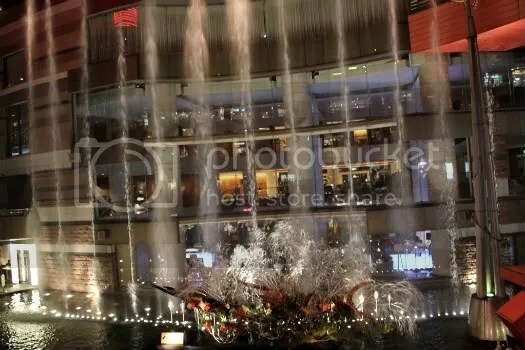 And if you stay till night time you are in for a treat because they have a beautiful musical fountain display.